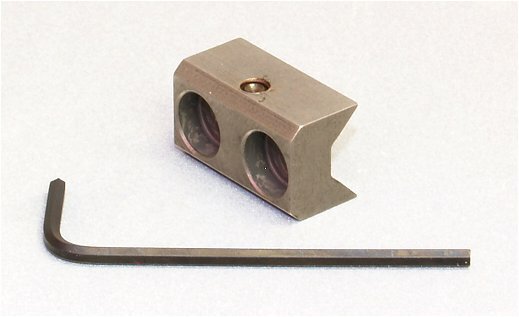 Tactical Innovations Adjustable V-Block allows you to get a perfect answer to the particular barrel "droop" characteristics of your personal Ruger 10/22. The factory V-Block tightens your barrel back and down, which can negatively effect scope alignment. This adjustable V-Block lets you tighten the barrel with little or no barrel droop! It installs like the factory V-Block but you can tighten an allen screw against the barrel to dial out the droop. Available in Blue Steel or Stainless Steel. The adjustable V-Block is from our Tactical Innovations collection. We take pride in offering the very best products for your Ruger 10/22. From magazines to barrels, stocks, scope mounts, and action tune-ups. See everything on our website at Ruger 10/22 Accessories. This seems to work as advertised but I would prefer the solid type I think. The set screw makes contact with the barrel itself. Worked as promised. No complaints.